The next big competitive advantage in insurance will be created by the ability to capitalize on "momentary markets," or personalized policy and service offers tailored to customers' unique life moments and delivered in real-time, according to a new report from Accenture (News - Alert) (NYSE: ACN). The report, Technology Vision for Insurance 2019, notes that we're entering a new "post-digital" era, where success is based on an organization's ability to master artificial intelligence (AI) and other new technologies. The post-digital era doesn't mean that digital is over, but rather, that it's no longer a differentiating advantage - and now the price of admission. As technology-driven interactions create an expanding technology identity for every consumer, insurers can tap into customers' digital demographics to deliver hyper-personalized, on-demand services that meet customers' specific needs, according to the report. More than four in five respondents (84%) who participated in the Technology Vision survey believe that digital demographics give their organizations a new way to identify market opportunities for unmet customer needs. 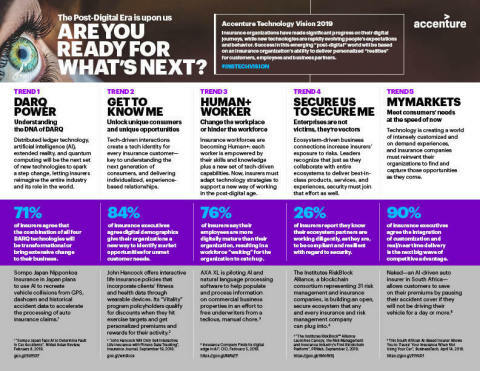 "There's an opportunity for insurers to increase and improve their touchpoints with cutomers and forge a stronger, more personalized experience by harnessing customers' digital footprints, but they'll need to digitalize their core before they can reach these new heights," said Daniele Presutti, who leads Accenture's Insurance practice in Europe. "Most traditional insurers are behind the curve in this 'post-digital' world, with a heavy reliance on mainframe technology. This makes it difficult for them to explore opportunities in the cloud and technologies such as AI to transform their operations, accelerate time to market and improve security. It also makes them vulnerable to the early adopters of these technologies as well as the nimbler 'post-digital' upstarts." The report also suggests that failure to master social, mobile, analytics and cloud (SMAC) technologies will leave insurers unable to serve even the most basic demands of a post-digital world and prevent them from embracing the next wave of digital disruption - distributed ledger technology, AI, extended reality, and quantum computing (DARQ). This new set of technologies will let insurers reimagine the entire industry and its role in the world. "For insurers to excel in the 'post-digital' environment, they've got to become more agile and implement SMAC as a core competency before they can rotate to newer technologies, including distributed ledger technology and AI," said Jim Bramblet, who leads Accenture's Insurance practice in North America. "They'll also need to carefully choose the customized and on-demand customer experiences they want to target and work backwards to map out how to get there, determining which ecosystem partners they need and where their place in that ecosystem will be."